Jan 6, 2008 – Today’s post is written by a woman I know who is thinking of retiring to Mexico in the future and has spent time on several expat message boards about various parts of Mexico. Her opinions are hers, not mine, but very interesting I think. and I’ve added my comments at the bottom of the post. I’ve noticed that expat communities in each of the major gringo magnets are a little different. All my observations come from regularly lurking on several message boards over a period of months and getting a feel for the personalities that frequently post there. Granted, it’s a small and probably very skewed sample. But put the personalities together with what you can learn from the boards about that particular place itself, and you can definitely observe differences and form impressions. If you visit the boards for awhile, you’ll see what I mean. The Lakeside communities attract more of the older, retired crowd. These communities self proclaim to be rather quiet with not much in the way of nightlife. The interactions on the message boards, both chapala.com and chapalaforum.com, are frequently aggressive, contentious and often just nasty. I’m sure there are probably a lot of very nice people who live in these communities, but my impression from these boards is that there are too many with bad attitudes. Many have made Lakeside into gringolandia by importing their U.S. lifestyles there, then they complain about the next wave of new expats who do the same. A couple of years ago I gave up on the idea of retiring in Mexico because of what I saw on chapala.com. But I later found other Mexico expat boards and blogs where there was a more positive atmosphere, so I’m back to considering Mexico for retirement. However, without having visited and based solely on what I read on these two message boards, I don’t think the Chapala/Lakeside area is for me. The Merida Insider board at meridainsider.com, although at times showing some bickering and sniping, is a much friendlier place. There seems to be a steady stream of younger expats in their 40s, 50s and even 30s, some with children, moving there. So the English speaking expat community here is not all retired folks. Far from it. Merida is a city and thus has more cultural offerings in the way of music, visual arts and festivities. There’s a huge renovation movement going on in the centro historico made up of expats buying and fixing up properties that Yucatecans can’t afford to or don’t want to repair. The English speaking expats are a much smaller percentage of the community than they are in Lakeside. English is less widely spoken there by the Yucatecans, but that doesn’t seem to stop many from moving there with inadequate Spanish. These same people then advise others not to do that on the message boards, but no one seems to be paying any attention and people with inadequate Spanish continue to move there on a regular basis. This is a community which would greatly interest me if it were not for the relentless, punishing summertime heat. Been there, done that. I can take humidity better than I can tolerate temperatures over 90. I have the impression that SMA is more artsy and expensive. There certainly seems to be a large number of expats with a large amount of money making large amounts of renovations and improvements on their Mexican homes. However, Carol, the board owner of Falling in Love with SMA, is a big SMA booster and lives very simply there on Social Security. Apparently apartments at “reasonable” rents can still be found, just not easily. The board is small and doesn’t have a lot of activity. Carol moderates it well and doesn’t tolerate incivility. The people who post there do seem nice, friendly and helpful. The arts are indeed huge here. It’s a small city, so there is more to do than at Lakeside, and more night life. I might like it there, yet the fact that, once again, there is such a large amount of Americans living there doesn’t appeal to me. The Viva Veracruz board is small and doesn’t have a lot of activity. People are very nice in their message board behavior. There was only one sarcastic, nasty and insulting person posting regularly at the beginning, but he stopped posting just about the time when the board owner was probably going to ban him. The people who frequent this board seem to be more interested in environmental issues. They seem much more independent and not to need to live in an area with a lot of other English speaking expats. For many of them, that’s why they are in Veracruz: because it’s not an area favored by most of the expat crowd. This area interests me a great deal, especially Xalapa and the surrounding villages. I have yet to find a Guadalajara board, although I know there’s a fairly large group of Americans and Canadians who live there. I’ve been told that there isn’t really an English speaking expat “community” as such in Guadalajara. That says to me that these people are independent and not joiners. That’s me all over. Maybe there isn’t a board because the English speaking expats wouldn’t likely participate even if one existed. The few who live there that I’ve run across on the net seem like nice people. Guadalajara interests me a lot, also, for the availability of cultural offerings, activities, goods and services, in that order. My friend doesn’t mention the best expat board of all: mexconnect.com which has sections for all the different areas of Mexico as well as a lot of general topics: learning Spanish, travel, etc. I love it. And she is surely throwing the baby out with the bath water with regard to the Lake Chapala area. Seems to me there is lots of nightlife here — live music, some theater… and lots of daytime cultural events too. However, since she wants an area with fewer expats, somewhere else would be better. We liked Xalapa a lot ourselves, but it is quite a lot warmer (though not as bad as Merida) and somewhat more prone to noticeable earthquakes than here at Lake Chapala. How can anyone judge a community or its people by what you read on a forum on the ‘net? What ever happened to visiting a place and meeting the real people who live in a town and who don’t spend their time on forums? I’m sure there are people in every town who have nothing better to do than post negative comments and junk. But for the majority, in Ajijic and Chapala, people are out leading interesting lives, participating in all sorts of activities, communicating face-to-face. What a concept. The quality of a forum is not how I would judge a community. And I spend a lot of time on the ‘net, just not in forums because most are a waste of time. I’m not familiar with the one you mentioned but it does sound valuable. Most things have to offer value when they require a fee. I can hardly wait to get back to Ajijic where we had retired for a few years. I’m coming just to visit in 2 weeks. Thanks for this excellent blog! I figured this post would get some reactions, and it happened within an hour or so! Thanks for your comments! I agree with your general analysis that blogs (and affinity groups for that manner) vary with geography. I live in and write about Xalapa, but I am trying to create something unique via the use of video, photo slide shows, Google Earth, and Google maps, information about road navigation using GPS, and a CommunityWalk map that pinpoints important shops, good restaurants, sites to see, cultural venues, government buildings, and so forth. This means I am out in the field a lot and not just sitting behind a keyboard. 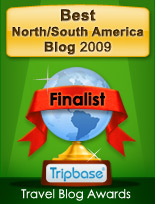 I just took a look at Rich’s blog listed in the post ablove and recommend it for anyone interested in Xalapa. Thanks for the complement Rosana. I will list your blog in my recommended sites and check in from time to time. I live in Xico near Xalapa and have to first write that in no way is Xalapa hot – here it may be being confused with Veracruz (the city). Prone to earthquakes – no I don’t think so – been here three years plus and not even a tremor or any near history of any. I agree with the comment that suggests judging an area by the forum(s) is hardly a valid method – I have followed some treacherous Forums that were taken over by some real angry misfits that in no way represent the area they were formed upon – sadly. Finally, I am the moderator of the Viva Veracruz Forum and appreciate the positive review by the author. The Xalapa area is a hidden jewel. It has a lot to offer anyone that is independent in spirit and finances ;-) It generally is grossly misunderstood or represented by the Mexico guides – perhaps to those in the know benefit. Definitely agree that it is not hot in this area. Some afternoons in April and May (dryest time of year) can get up into mid or upper eighties, but it always cools down at night and well into morning. It IS humid much of the year (but not today: perfect day today. Unbelievable.) Humidity in the rainy season (June till October, más o menos)is quite high and affects some people noticeably. There have been two times when earthquakes were felt here in the past two years…in Coátepec and Xalapa for sure, but we didn’t notice where we are, between Coátepec and Xico. Sr Calypso was in the States when they occured. There is no recent history of big ones. In the 1920’s, a large dam was broken by an earthquake at Baranca Grande, near Teocelo, resulting in a large loss of life. I would like to highly praise the Yahoo group, VisitXalapa and the associated links. This group provides a lot of information and friendly exchange, ebbing and flowing as folks have something to say, though mostly pretty active. It has a lot of specific information about our area. Basically, it serves the function of a forum. I also agree that a local forum isn’t a good indication of a community. USAers here lead very varied lives,some living a pretty good city life in Xalapa, some in suburbs, some in rural areas. There are towns with only one or two foreigners, and groups with more, like the Xalapa symphony. I don’t think most USAers came here, however, to look for a USA community specifically. I am not sure that the online forums are good indicators, but I still find it fascinating the way that similar people tend to find themselves in the same parts of Mexico. Great comments, everyone! Thanks! We found Xalapa hot on a day we were there in March I think but not compared to many places, and that could have been a fluke. Glad to know it. We’ve lived in Merida for the past 3 years, lived in Puerto Vallarta for almost 10 years, also lived in Zacatecas, Tijuana, La Paz, Guadalajara, Aguascalientes, San Luis Potosi- but have gone back and forth to the US too. We have dual citizenship and are 100% bi-lingual and bi-cultural and live somewhere between American and Mexican style. Husband is retired, son is 17 and finishing Prep School program online from a US school- I am an award winning Chef and not retirement age so I plug along and have had restaurants in many places, from formal bistro’s to home-based dive’s…. due to the effect of the weather on my husband and son we are moving (next week in fact before Spring break) to the Puebla / Tlaxcala area and hope to settle there for a while (we are gypsies at heart so how long is a while? who knows…lol) BUT have also considered Queretaro, Guadalajara and Los Altos de Jalisco…. we would like a medium sized city or one close by so our son can have some fun (us too!) shopping, movies, etc. but we’re not adverse to a rural setting so we could do some organic vegetables and plants. I wanted to say I found your blog more optimistic than most, since Merida Insider got hacked and went down (has been replaced by Yucatan Insider king of) the new site is Yolisto, but it’s somewhat boring to me… just doesn’t have “it”, you know? I’m upbeat and would like a resource for info and to touch base now and then, but you need a good amount of back and forth to make it interesting too… anyway, nice blog and good vibe. Let me know if any of you will be close by to us…. Ciao!